Your AppAttract Ads will Be Instantly Displayed Throughout our Network Of Mobile Apps and Websites. Would you like to discover how to build your own mobile Phone App Like the one just below? for FREE ! We reveal everything in our exclusive members area. We will reveal how YOU can Place Adverts on not only your own Mobile App* or Mobile compliant Website or Blog, we will also show you how you too can build your own fully operational and functioning Mobile Apps and have them freely available on the Android Market and the i-phone market place where others can download you App. We will reveal a complete system capable of building Android and i-Phone Apps, which will in turn deliver our AppAttract Advertising Exchange adverts and Banner Exchange adverts. Yes that's right, within minutes of joining our AppAttract Advertising system you will be able to build your first Mobile App with our unique ads code embedded in to your App enabling your Ads to appear on other AppAttract members Apps in the same category as yours. You will be able to advertise your own products, Services, or Affiliate Link Banners on potentially thousands of Mobile Apps throughout the World. The AppAttract Mobile Phone and website advertising system allows you to display your own advert in several different formats, text ads, widget ads, and Banner Ads. We also realized that many people are really struggling to work out how to work with Mobile Phones, or even how to make their websites display correctly on Mobile Phones, Tablets and I Phones. We not only show how to advertise on all of these platforms, We will show you how you can build your own mobile phone Apps and Mobile Compliant websites which will deliver our AppAttract Advertising Exchange adverts and Banner Exchange adverts. A system where not only will your adverts be displayed on potentially thousands of other peoples Mobile Apps and Mobile Websites, but where those ads could passively spawn more ads with little to no effort on your part? Would you like to harness the power of Mobile Phone Advertising with Ads like this one here ? 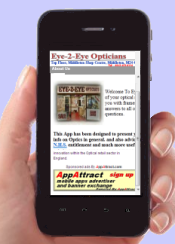 Would you like to Advertise your product or service on other Peoples Mobile Phones and websites? Should I have a Mobile App or a Mobile Website ? That depends. But in reality even if you do decide to build an APP you will probably still need a Mobile Compliant website. This is why we decided to make the AppAttract advert delivery cross compliant so you could still take advantage of both options without being forced in to making a decision on one or the other platform !! The beauty of AppAttract is that you can place your adverts on Apps and websites and reap all of the benefits !! DID YOU KNOW THAT OVER 60% OF THE ADULT POPULATION IN THE USA ALONE HAVE A MOBILE PHONE ! Isn't that incredible! Are you seeing what I'm seeing ? What would it be worth to you if someone was prepared to demonstrated to you how virtually anyone can build a Mobile Phone App. A mobile Phone App which is also capable of delivering your own AppAttract Adverts, advertising YOUR products or services across our advertising network, and possibly across literally thousands of other Mobile Apps and website all over the World ? We reveal everything in yet another of our series of training videos where you get to watch over our shoulder as we create a mobile App right in front you. What would that system be worth to you if we then went on to show how to enable YOUR Mobile App to be installed by potentially millions of people via the "Google.Play�" network? What if we then showed you exactly how to do it in a video where you get to watch over our shoulder as we reveal everything ? Would that be of interest to you ? You Bet it would !! What if we said we had made it possible for you to gain access to all of those features ? Deliver your own AppAttract Adverts on your own mobile phone App in less than 4 minutes from now, and for just Cents on the Dollar ! A system where your AppAttract Adverts were cross compliant so that Your Adverts would appear on Mobile Apps, Mobile Compliant websites, and Blog platforms simultaneously. OF COURSE IT WOULD !!! You would be screaming from the roof tops! Where can I sign up? Here is how AppAttract can revolutionize YOUR Mobile Apps Marketing efforts right here and now ! YOU will be able to place advertising adverts on your Mobile App, or Mobile websitein simple text style ads format, widget format, or Banner Ads using our Unique AppAttract Mobile Phone Apps advertising exchange. 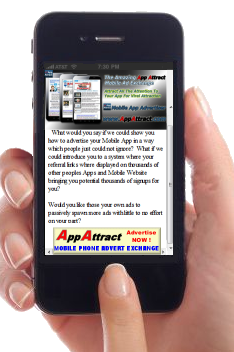 AppAttract mobile App and mobile website adverts are extremely effective! Just take a look at the extraordinary package we have put together for you, including our mobile ad exchange text adverts, widget adverts and banner advert previews, which we have placed throughout this page, so that you can see the Ads working Live as they would on your App or Mobile Compatible Website. The AppAttract Advertiser system is an incredible system for promoting YOUR product or service on Mobile Phone Apps, Mobile Phone compatible websites, and blog's throughout our network of users. Join us NOW and lock in these great prices for life whilst we have Early Starter Offers Available !!. AppAttract adverts are difficult to ignore! AppAttract Ad units all comply to the Mobile Marketing Association Guidelines which are increasingly accepted as best practice across the industry worldwide and are defined as 'universal' mobile ad units. The Universal Mobile Ad Packages are supported by both the MMA and the IAB. This is a Live Area Image. AppAttract ads are far more powerful than the average type of advertisements on other mobile networks because we designed our ads delivery and integration specifically for the Mobile Apps marketplace. When an AppAttract advert is displayed, it earns you credits enabling your advert to be shown on other members Apps or mobile devices. Because of this our credit system ensures that everyone in the network also shows their ads because they too want even more people to see their advert. It's a true Win-Win Ad Exchange ! AppAttract is an ad exchange, plain and simple !! For every advert which is viewed from your Mobile App or mobile website your advert will be displayed on someone else's App or Site within our network of Advertisers and publishers. We don't like Bidding wars at AppAttract !! We believe in a fair exchange system !! The AppAttract Advertiser is an incredible system bringing warm prospects to whatever product or service you are advertising. Whether you are simply List building or promoting a product or service AppAttract is designed to help you achieve your goals. With AppAttract that is easily achievable by simply adding a short snippet of code on to your Mobile App or Mobile compatible website. By adding our code to your site, your advert is immediately included in our rotator system for display on other members mobile App or Websites who are also advertising products within your chosen category. This means that each time your App or Website is visited it automatically generates advert credits to your account. Once you have earned enough credits on your account this automatically triggers a response from our system which immediately activates your Advert in the rotation system and it displays on someone else's Mobile App or Website. The Advantages of this is that it creates a viral effect because your adverts are now potentially being seen by visitors to Mobile Apps or websites which you would not normally be able to target with traditional advertising methods. AppAttract show vastly more effective mobile App and mobile website adverts than most or our competitors because we specifically designed our adverts to work on Most Mobile Phone platforms and Mobile Compatible Websites and Blogs. 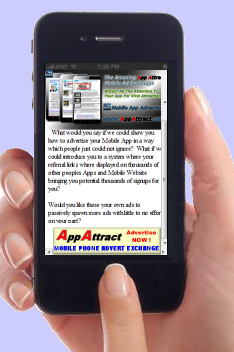 AppAttract adverts are so easy to produce and insert in to your App or Website too. 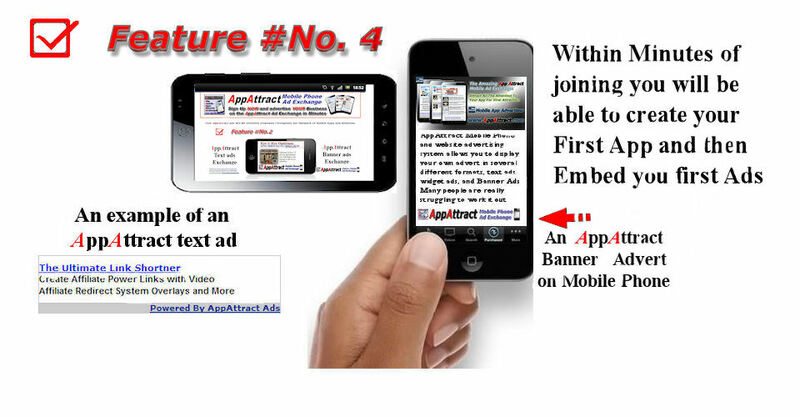 AppAttract text style adverts are amongst the most popular and fastest growing formats of internet advertising. Many Studies have shown that buyers are more susceptible to read and buy from Text-Based Ads than adverts that appear in popup's or fly-ins, no matter how pretty the popup's are. AppAttract mobile App and mobile Widget Style adverts do not interfere with the sales process of your App or Mobile App or website. AppAttract widget and text style adverts are amongst the most popular and fastest growing formats of internet advertising. Many Studies have shown that buyers are more susceptible to read and buy from 'Text-Based Ads' than adverts that appear in popup's or fly-ins, no matter how pretty the popup's are. They are specifically designed to attract your visitors attention with the embedded text style advert placed inside your widgets. There are several sizes and designs already in our system waiting for you to simply add your text, collect the code, and add it to your App or Mobile website and your advert will immediately be included in our network exchange. The Tall Widget on the right ->->-> is specially designed to fit in the sidebar of most popular Blogs and contains up to four text style adverts. 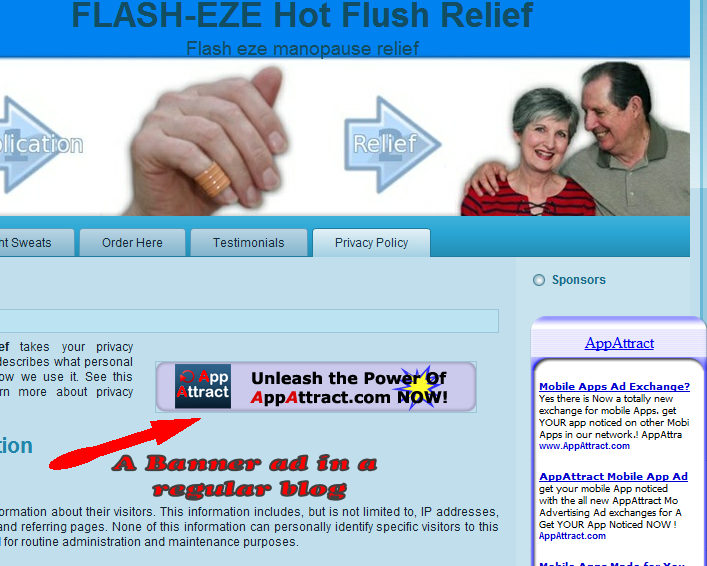 These type of widget ads are very popular and and can also be placed on regular Mobile Compatible websites. There are several size options for you to choose from which all comply with the Mobile Advertising Standards sizes. WATCH THIS VIDEO AS WE CREATE A BANNER ADVERT AND PLACE IT IN A MOBILE PHONE APP READY TO WORK FOR YOU IN LESS THAN 3 MINUTES !!! Banner advertising is one of the most popular types of advertisements used today, so why not increase your website traffic by exchanging banners with other Mobile Phone App users and Mobile ? it makes sense to exchange Banner adverts with other users, especially if they are targeting a related topic or subject. With AppAttract your banner ad will be shown on another members App or website from the same topic as yours. That ensures that your Ads are not wasted like they are on many other banner exchanges. Many Mobile Apps and mobile websites are only quite small compared to a normal website, and the standard 486 X 60 banner ads are just far too large for a Mobile App or mobile Website so we designed AppAttract exclusively for the smaller banners which are required to work effectively on Mobiles platforms. All AppAttract ads can also be placed on any regular website or Blog so that you can still use our system even if you don't yet have a mobile Phone app yourself. Your banner is then attached to the link to where you want viewers to go after they click your banner. Its a simple one step process, just upload your image, enter the URL of the target site, and that's it !! We then moderate the advert to make sure it is suitable for our members and once activated your banner will start to display in our system. SIMPLE !! With banner advertising the more times that your Banner ads are displayed to a greater number of people .... the more familiar that your company and business will become to prospective customers. This is building YOUR brand awareness. All of the most successful businesses know that "on average" you generally need to make as many as 4 - 7 impressions on a person's mind before their awareness begins to accept the idea of making a purchase or trying your product or service. AppAttract Banner advertising is a great way to drive targeted traffic direct to your product whilst at the same time building the brand awareness for your business & products. The Beauty of the AppAttract Banner advertising system is that the monthly cost are fixed according to your membership level, this means that you will not have to "bid" against other advertisers in your category, your banners are rotated throughout our network, as the network grows so does your exposure, it becomes a viral advertising system all of its own. Below is an example of a 300 X 50 Banner advert rotating in our network, this is a live advert for you to test, and also if you want to see how the adverts rotate in our system simply refresh this page in your browser, or press F5 on your keyboard and a new advert will appear each time. That is how our system works, you place your AppAttract code on to your Mobile App or website and you are in the network rotation system SIMPLE !! Hi there Geoff and Bruce. 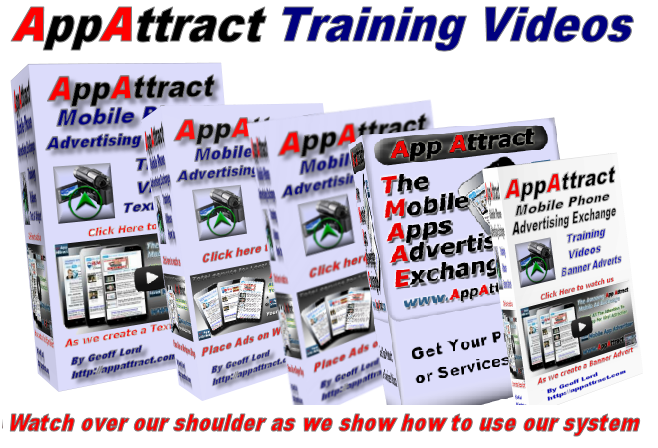 We would just like to say thank you very much for introducing us to your amazing AppAttract system. We are very excited about the possibilities which your system opens up for us. We are totally new to Mobile Marketing but with your help and your great Advertising system we are confident that our market share will increase beyond our wildest dreams. We would also like to thank you for taking the time to introducing us to a Mobile Site Builder and setting that up for us. Once again, thank you, especially for helping us to get our AppAttract Adverts displaying on our Mobile Phone App and our Mobile website which you built for us. AppAttract Adverts are only shown to targeted, interested prospects. When you set up YOUR adverts, you can select a category from an extremely comprehensive list of site types. Your advert is guaranteed to be only shown to people from the "Sub-Categories" YOU choose. Let me explain. One major disadvantage with most other Advert exchanges is that you normally have to display ads on your own site containing ads from other members within the same exact category as your own product, in other words your main competitors !! We thought that was a major flaw, so we decided to make it possible for AppAttract exchange members to display ads from within the same "category group" but not necessarily the exact same sub-category !!! so now you don't need to advertise your direct competitors product on your site !! You can select to advertise in you own category only if you wish, or you can choose to select up to Three sub-categories from within the same Main category of your own product which still ensures relevance of products or services but avoids direct competition. To ensure that you earn maximum profits from your adverts the AppAttract system also incorporates a sophisticated anti-fraud system to guarantee that your advert is being seen by a real person each time, as apposed to a script surfing the net. 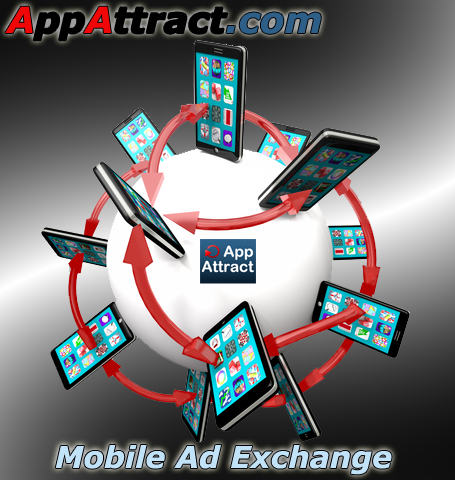 You can be up and running with AppAttract mobile App and mobile Website's ad exchange for in less than 60 seconds! No irksome sign up methods. We designed AppAttract to be simple to join. You'll be up and running with YOUR AppAttract mobile App and mobile website advertising system ready to place on your App or Mobile Site in just 60 seconds if you start right now and follow each step we give you. Once Inside the members area you find all of the training videos and FAQ's that you need to get you up and running very fast. And don't forget to watch the "Quick start" videos we have prepared for you. These will enable you to have a live advert set up and running on the advert exchange very fast so that you can get your products listed and running in the Ad exchange in no time at all. 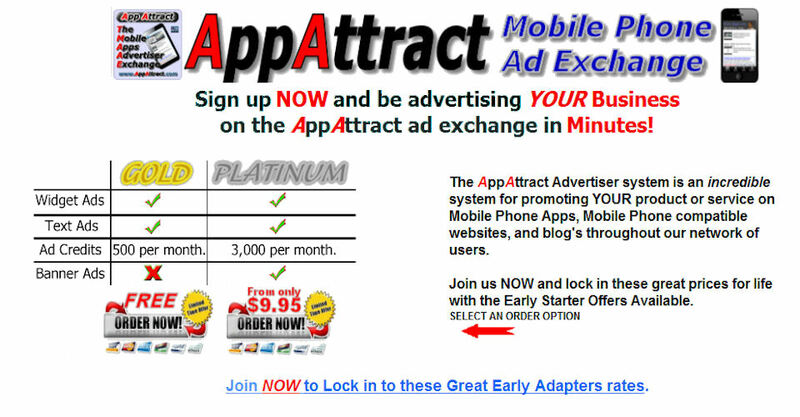 Thank you very much for introducing us to your amazing AppAttract system. 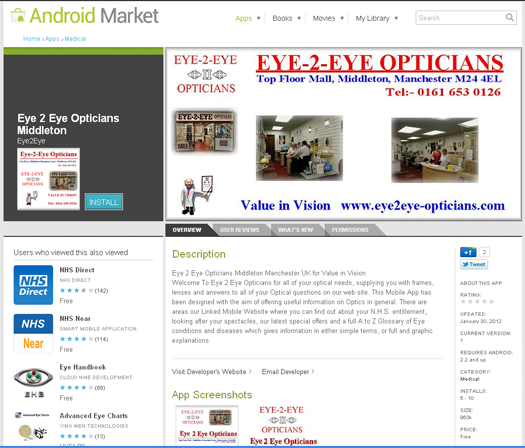 We were amazed at how easy it was to build our first App and include your banner adverts on to it. We are excited about the possibilities which your system offers up for us. We are also totally new to Mobile Marketing and had struggled for a long time trying to work out how to get an APP built but with your help and your great Advertising system we have managed to Kill two Birds with one stone as they say. We are certain that we will be able offer our Patients and potential patients a method of keeping up to date with what we have to offer and the ability to contact us direct from their Mobile Phones at any time. Once again, thanks for helping us to get our AppAttract Adverts displaying on our Mobile Phone App and our Mobile website which you built for us. You are in full control of the cost of your advertising campaigns at AppAttract. We believe in SIMPLE. Yes there are just three levels of membership at AppAttract. Level 1 Membership guarantees you a minimum of 500 ad credits each Month, PLUS you will receive additional credits from your own efforts. Each time your App or website, which is embedded with your advert code will earn further credits for your own advert enabling them to be shown even more often within our network !! Remember our Tiered system is working for you in the background and it gets really interesting when other members in your network start showing their ad too !! Level 2 Membership guarantees you a minimum of 3000 ad credits each Month, PLUS you will receive additional credits from your own efforts because each time your App or website which is embedded with your advert code we give you will earn further credits for your own advert to be shown even more often within our network !! Remember once again that our unique credits system is working for you in the background and it starts to get really interesting when other members start showing their ad too !! Level 3 Membership is a deeply discounted level saving you over $109 per Annum and guarantees you a minimum of 10000 ad credits each Month, PLUS you will receive additional credits from your own efforts because each time your App or website which is embedded with your advert code we give you will earn further credits for your own advert to be shown even more often within our network !! Remember once again that our unique membership system is working for you in the background and it starts to get really interesting when other members start showing their ad too !! *NOTE:- this exclusive membership level is only available at the time of signing up so think carefully before you overlook the opportunity to not only save $100, but to get more exposure for your products !! I was let in on this marketing miracle before it launched live. What I found inside was well organized, easy to use and almost mind numbing to think how they make it so easy for you to do everything. I don't buy lightly into the shiny button syndrome and I had previously built my mobile compatible sites by trial and error, but these guys show you the where, why and how in step by step video training. What I see from within this mighty application is power with a built in income stream while saving me advertising dollars and time. There are just so many things that AppAttract Mobile App system can do. We show you how to create and and use the increasingly popular QR Codes which you can then print out, use on your website or on leaflets promotions. The Possibilities are endless, QR codes are everywhere !! The QR Image code on the right will take you to a demonstration page of an App in action on the Android Market. Join us NOW and lock in these great prices for life with the Early Starter Offers Available. Join NOW to Lock in to these Great Early Adapters rates. AppAttract.com is a trading style of Termspec Ltd. All other trade marks mentioned are the property of their respective owners. All rights reserved. Unauthorized duplication or publication of any materials from this site is expressly prohibited. Persons appearing in the videos are either the owners, employees of Termspec Ltd, or professional actors depicting the experience of the developers and owner of the AppAttract product. No statistical information has been collected from users of the product and therefore no claims of earnings or earnings potential is intended. Due to the many variations and levels of expertise of users, their own experiences with AppAttract may not be typical or average, nor do they represent a guarantee of users personal results. The owners of AppAttract have a material financial connection to the provider of the goods and services referred to on the site and may receive payments for each qualified sale.